Brakes International a unique online web catalogue. 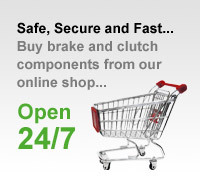 You can now purchase brake parts for next working day delivery at trade prices. This online braking catalogue has been designed from the outset to be user friendly; even novices can find all the information they need online. The catalogue is easy to follow, with plenty of help on each page. The data, images, prices and stock situation come directly from our main servers here at Brakes International; so when any information is updated, you will see an instant change on your PC. There are currently almost 10,000 brake part images on the website, including technical diagrams and photographs. These allow the user to view and correctly identify the product before purchase. For technical purposes users may also print these images.